Equity and equality are important themes in food and nutrition, but the existing literature has only partially addressed these issues. In this blog, Jody Harris, a food and nutrition researcher at the Institute for Development Studies, describes a paper that she co-authored with Nicholas Nisbett about equity in development studies research. We already look at gender equity in our research, right? And income inequality perhaps? But should we be doing more? A recent paper that I (a nutritionist) co-authored with a colleague (an anthropologist and geographer) suggests that while a lot of international food and nutrition research concerns itself with aspects of equity and equality, the closely-related discipline of development studies has been looking at these issues for a lot longer, and can help us to look at them more comprehensively. What are equity and equality? The key concept that underpins equity and equality is marginalization, the treatment of a person, group, or concept as insignificant or peripheral. We know that much nutrition research addresses marginalization, such as the disempowerment of women or disparities in income. But looking through the literature, we see that food and nutrition research so far has only a partial treatment of equity and equality issues. Other axes of marginalization - such as age, ethnicity, disability, sexuality, and geographic marginalization - come up far less often in this literature. And the interactions between these different aspects of marginalization are assessed even less often, despite the fact that these different dimensions will very likely intersect. For example, a poorer, younger woman of a marginalized ethnic group might be multiply-disadvantaged in terms of personal resources or service access compared to someone with fewer or none of those traits. Where do equity and equality come in? 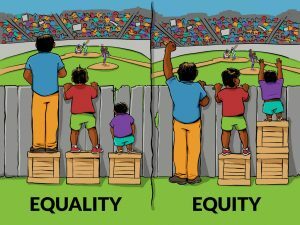 While the now-infamous ‘boxes’ picture has been critiqued, it shows that equity and equality approach marginalization in different ways. Equality focuses on outcome, or the ‘sameness’ of a final distribution, a utility-maximizing approach that underpins much of development economics (i.e., the state of being equal). Equity focuses on process and the fairness of a just distribution, a distributive justice approach taking into account the range of needs (i.e., the quality of being fair). Inequities and inequalities are complex and mutually reinforcing, and food and nutrition research must explicitly focus on understanding both equal outcomes and fair processes for sustainable development. Both equity and equality are underpinned philosophically by moral equality: the idea that all people count and should be treated as equals. They are normative concepts saying that people should be treated equally. Talking about equity and equality is therefore value-laden, based on how we think the world should be, but no more so than aiming for economic growth or human rights, which are also choices based on value systems. The terms equity and equality are often used interchangeably; ultimately, both concepts are important. What is required to focus food and nutrition research on both equality and equity? Whatever the approach in a particular piece of work, food and nutrition research would be strengthened by more explicit recognition of marginalization, equity, equality, and power, and researchers should explicitly account for these in their initial theories of change and subsequent research plans. Multidisciplinary teams applying concepts and learning from literatures with a longer history of addressing these concerns, such as development studies, can bring fresh perspectives that just might bring more sustainable change. Harris J & Nisbett N. 2018. Equity in social and development-studies research: Insights for nutrition. In: Advancing equity, equality and non-discrimination in food systems: Pathways to reform. United Nations System Standing Committee on Nutrition. Jones H. 2009. Equity in development: Why it is important and how to achieve it. Overseas Development Institute (ODI). Cultural Organizing. 2016. 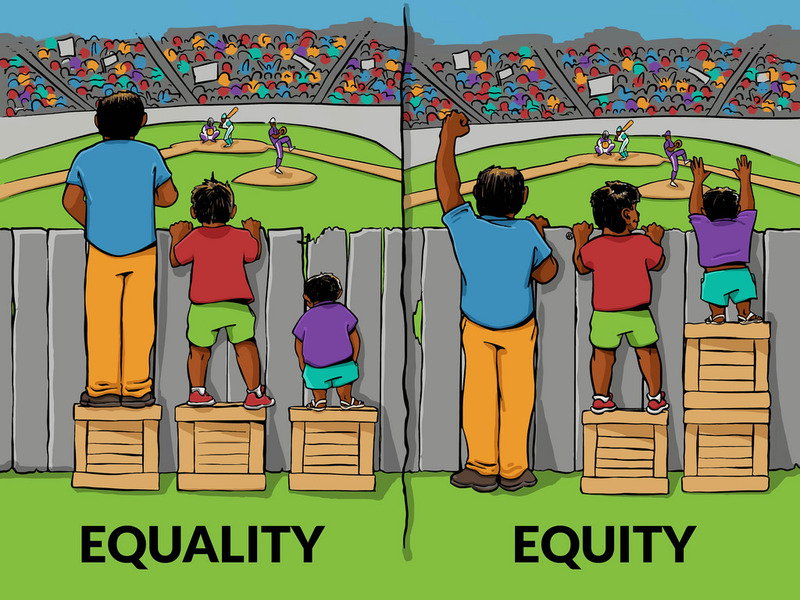 The problem with that equity vs. equality graphic you’re using.